Green Garden Salad w/ Baked Chicken Tenders — Happy Food Co.
PLACE chicken breast tenders in a 9x9 pan and cover with buttermilk. Set aside. SPRINKLE parmesan cheese in equal rounds on one baking sheet. SEASON to taste with garlic salt and pepper. Set aside. SPRAY the second baking sheet with non-stick spray. SPREAD the breading mix on a large plate. REMOVE chicken from buttermilk and coat both sides generously with breading. SEASON the chicken to taste with salt and pepper. ARRANGE chicken on the baking sheet. Discard the leftover buttermilk and breading. PUT both baking sheets of chicken and parmesan in oven. BAKE chicken on middle rack for 15-20 minutes or until cooked through (no pink inside). BAKE parmesan crisps on top rack for 10 minutes or until golden. Keep an eye on the cheese to ensure that it doesn’t over-brown. COMBINE all salad ingredients in a large bowl (except for the cooked chicken and parmesan crisps). Top with desired amount of dressing. Step 4: Serve It and Enjoy! 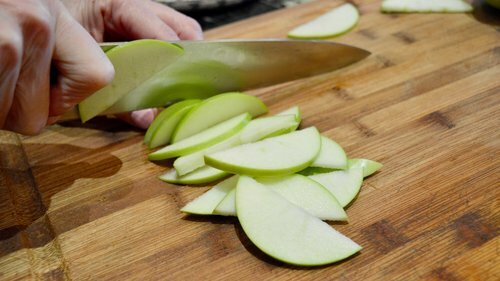 SLICE the cooked chicken into bite-sized pieces on same cutting board. 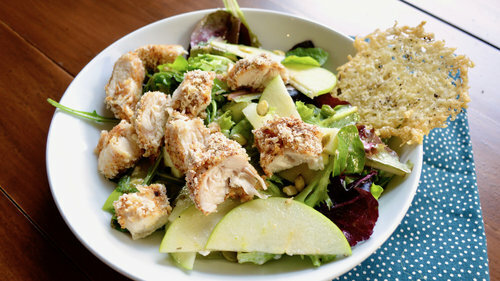 SERVE salad topped with cooked chicken and parmesan crisps. ENJOY all that green garden goodness! Offers layers of ripe citrus fruits, including Meyer lemon, ruby grapefruit and Kaffir lime. These flavors meld with rich notes of lychee, passion fruit and a touch of pineapple.